The Work Order Management demo app lets you manage work orders, customers, parts, and invoicing for field service activities. Follow the instructions or watch the video below to use the demo app. Login to https://try.flowfinity.com from your web browser. Ensure that the Work Orders Site is selected from the Site drop-down menu. Click on the 'Customers' tab to manage the customer list. You can add customers manually or import them from a CSV file through the Activities menu on the left. Click on any individual record to view or update the customer details. Each customer record contains information such as contact details, discounts and tax rate. Click on the 'Parts' tab for a list of parts available to field service technicians. You can add or import parts through the Activities menu on the left. You can also view details or edit parts from the web, or on a mobile device. Click on the 'Work Order Management' tab and then click 'Dispatch Work Order' from the Activities menu. Select the customer and field technician. For this demo, you can dispatch a job to yourself, but in real use, this list would only show field service technicians. User permissions and activities are managed through roles. Enter the scheduled date and time, and instructions for the job. When you submit the record, the work order is dispatched to the technician's smartphone or tablet. 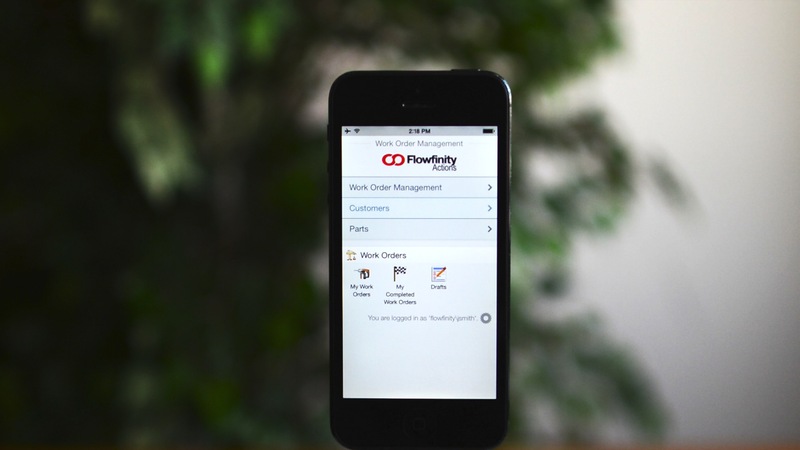 Login to Flowfinity on your mobile device and select the 'My Work Orders' shortcut on the portal. Select the dispatched job. Review the work order details on the first page and go to the next page to fill in the form. Enter the time you start work on site. Next, take or upload a photo of the job site before you start to work. Click the + sign to enter Parts Used and select the appropriate part from the list. Continue adding parts and quantities for all of the parts used on the job. When you've completed the job, take additional photos if needed, enter the length of your break and the time finished. Complete the job completion checklist. Have the customer review and sign the work order, then press the 'Submit' button. If you are working offline, your record will be queued for submission. If you currently have Internet coverage, you can immediately look up your submitted work orders in the "Completed Work Orders" view on your mobile device. In the web client, go into the 'Work Order Management' tab and select the 'Completed Work Orders' view. Click Search without entering any search filters to view all records. Select 'Edit Invoice' from the record menu to review the information and enter any additional discounts. Select 'Accept and Send Invoice' to email a PDF copy of the invoice to the customer and move the work order to the Invoiced state. After the work order has been accepted and sent, it will appear in the 'Invoiced Work Orders' view. To learn how to customize this app for your business, please request a demo or contact us.